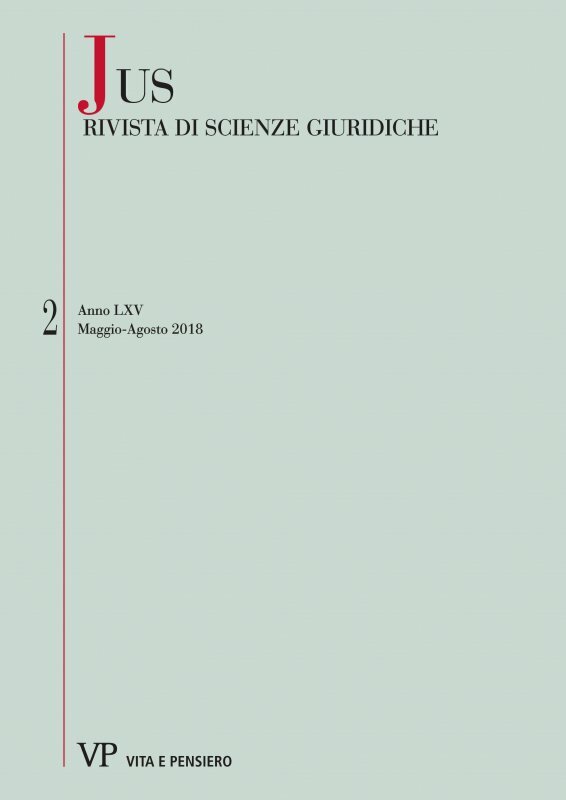 La rivista "Jus" è la rivista della Facoltà di Giurisprudenza di Milano dell'Università Cattolica dedicata soprattutto all'analisi dei problemi generali del diritto alla luce dei principi e dei valori perenni di ragione e di giustizia che devono essere affermati e custoditi in ogni tempo pur nella diversità delle condizioni storiche. In particolare la rivista, con i saggi e gli altri studi che ospita, intende contribuire alla tutela e alla promozione dei diritti dell'uomo e della persona e alla valorizzazione dei doveri e dei rapporti di solidarietà sociale nell'ordinamento interno come nell'ordinamento comunitario e internazionale. A ciò si aggiungono contributi più specifici su problemi e istituti che l'evolversi dei sistemi giuridici pone all'attenzione degli studiosi e degli operatori nei vari campi del diritto. I contributi presentati a «Jus» sono valutati, in forma anonima, da studiosi competenti per la specifica disciplina (double-blind peer review). Errore, intelletto e volontà nella Seconda Scolastica. Ricerca storico-dogmatica sull’errore “determinante del consenso” di cui all’art. 1429 c.c. One of the fundamental categories of the error is that of the determining error as also formalized in the art. 1429 Italian Civil Code; that error in the absence of which the subject would not have concluded the contract or in any case the legally relevant act. Unlike the theories of pandettistic matrix as also accepted by the art. 1109 and 1110 of the Italian Civil Code of 1865, and in the light of the rules in force, the interpreter must not today assess whether the error concerns essential circumstances of the contract, but whether the error is essential for the contractor, so as to determine its consent. This, which seems a novelty introduced with the codification of 1942, however novelty is not, sinking its dogmatic roots in the canonical doctrine of Second Scholasticism in the sixteenth-seventeenth century, which however already gave, albeit in nuce, some answers to current problems of essential error. The right of the Church had already understood these problems, and faced it, offering solutions that would have constituted the prodromes of the current interpretation of the civil norms in terms of error. This article has been inspired from the Paolo Grossi’s collection of essays entitled “L’invenzione del diritto” (the invenction of the law). It aims to consider some central issue – the nature of contemporary constitutionalism, the nature of the law, the role of the jurist – and reveal the “republican jurist” as the most suitable for a constitutional order which is not consinsent anymore with the rule of law as in the past. The research aims to identify the concept of “iustitia” in the works of Pliny the Younger and to ascertain whether this concept coincides or not with the one which marks in a peculiar way the Roman law. From the study emerges that the Plinian idea of “iustitia” does not coincide at all with what is found in Roman law, since a loyal and faithful servant of the State, that is Pliny, proposes a different theorization of iustitia, meaning it as an ideal of “social and economic ethics” of power and, at the same time, as a sure guide in the daily practice of government. The paper examines the role of influence and exercise of direction and coordination (attività di direzione e coordinamento) of the parent company in the framework of group of companies regulation. The analysis starts from the qualification of liability ex section 2497 Italian Civil Code (c.c.) in terms of mala gestio liability and moves on focusing on the role of the influence required by section 2497-ter c.c. as a trigger of provisions related with parent-subsidiary relationship. The last part of the paper compares the direction and coordination discipline with the supersocietà di fatto doctrine, a variation on the piercing the veil theory. The focus in this article is on the family institution, governed by the principles of our Constitution, in relation to the role of fiscal policy choices. The document, after introducing the concept of “fiscal family”, analyzes the current tax system with respect to the family and the future perspectives, also in light of the positive experiences of other jurisdictions and of the latest proposals of the “Osservatorio Nazionale sulla Famiglia”.